Finally, Dallas's reign of terror atop the Advanced NFL Stats team rankings is over. The 5-1 Ravens moved into first place this week with a 29-14 decimation of the Houston Texans. The Cowboys now sit at second place, partially thanks to a third loss on the season. Like the previous two losses, Dallas played well enough to win. 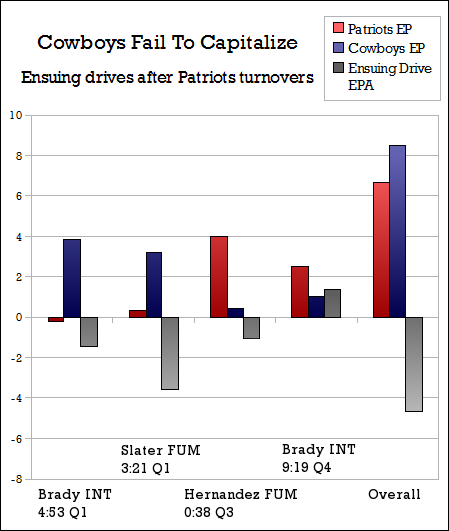 Unlike the Cowboys' other two losses, however, it wasn't about their own turnovers, but what they did with the Patriots' turnovers that resulted in their demise. The Patriots have been uncharacteristically sloppy in terms of ball control this season. Their 10 turnovers through their first six games is four more than the 2010 season, and Sunday marked New England's second four-turnover game of the season. In as tightly contested a game as last Sunday's -- one which finished 20-16 in the Patriots' favor -- it isn't difficult to imagine multiple scenarios in which those four turnovers turned the tide in favor of the Cowboys. But, of course, it didn't matter. Tom Brady got his chance to drive the Patriots to glory in the final two minutes, largely because the Cowboys only turned those four turnovers into six points. In four drives following Patriots turnovers, the Cowboys only managed 97 yards on 28 plays, with 60 of the 97 yards coming on one drive (a field goal to give the Cowboys the lead in the fourth quarter). In red, we see the expected points for the Patriots directly before the turnover. In the blue, we see Dallas's expected points upon gaining possession. And then in gray, we see Dallas throw away four chances to capitalize on these turnovers, in terms of expected points added on the drives after the turnovers occurred. Pretty plainly, until the Cowboys managed the aformentioned 60-yard drive for the then go-ahead field goal in the fourth quarter, the Dallas offense threw away (or worse) the opportunities afforded to them by the defense's takeaways. The Cowboys followed up the first Brady interception, giving them the ball a mere 23 yards out of the end zone, by losing six yards over six plays, settling for a field goal. Then, after Matt Slater fumbled the kickoff on the 32-yard line, the Cowboys managed just 11 yards on five plays before Tashard Choice fumbled the ball right back to the Patriots, costing the Cowboys nearly four expected points. The third turnover was indeed a much bigger stop for the Cowboys' defense than it was an opportunity for the Cowboys' offense, as Aaron Hernandez fumbled at the Dallas 16-yard line. The Patriots were driving and likely would have taken the lead in a 13-13 game. The Cowboys couldn't do more than gain field position, though, taking the ball to the Patriots 45 and then punting it into the end zone on fourth-and-10. Even the success of the go-ahead drive after Brady's second interception was limited -- the field goal left the Patriots with a 33% win probability, and when we adjust that for giving Tom Brady five minutes to execute a game-tying or go-ahead drive, it just isn't a winning proposition for his opponent. In summation, the Cowboys offense threw away approximately five points of the advantage presented by their defensive takeaways in what ended up being a four point game -- especially in the two early situations in which the Cowboys had the ball within 35 yards of the end zone and only managed three points. I still believe the Cowboys are a very good team -- as the rankings show, they have excelled at many of the things that make great football teams -- but until they can settle things, particularly inside the red zone, we may be seeing more of the same "so close, but oh so far" results over the rest of the season. Cowboys have a 33% Red Zone TD percentage (6 of 18). I expect that to heavily regress back towards the mean. As long as Garrett is calling the plays (has always done a poor job) and as long as Romo is running the plays the Cowboys will never ever win the big one! Any thoughts on Garrett's decision to run the ball at the end of the game before punting to Brady?